Trying to cross off another place on my list, I took a lunchtime visit to Keko Cafe. It's in a quiet part of Murray Hill that is very close to Koreatown. Walking in out of the cold, I was met with a warm and cozy vibe. Cozy mostly because the place is tiny, and chock full of whimsical items. Paintings, trinkets, tea pots, even suitcases adorn the walls and shelves. It feels a little bit like a European grandmother's attic. All the tables were taken, and everyone seemed to be enjoying their lunch. This is a good place to sit with a book or laptop. The music playing was Edith Piaf-esque, with an occasional Middle Eastern flair. Since it's a small place you can hear all the conversations around you, but it would be comfortable to sit for awhile and slowly enjoy a pot of tea. Service was efficient but brusque. 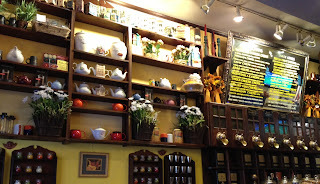 The cafe specializes in both tea and coffee, and they have a descent selection of basic teas. One look at the wall of tea canisters reveals they are all from Harney & Sons. Certainly not a bad thing! I'm on a Darjeeling kick, so I ordered a pot. It came in a small pot with the strainer inside, leaves steeping. The only problem I had is I couldn't find a place to put the used strainer. So I was forced to leave it in the pot and drink it quickly. The first cup was quite nice, a quality, smooth Darjeeling with that lovely muscatel flavor. But by the time I was ready for a second pour, the tea was bitter and almost undrinkable. I should have crammed the strainer on the tiny saucer, or asked for a second plate. I thought the tea was reasonably priced at $5 a pot. The food however, was a bit expensive. Sandwiches are small, without anything on the side except a miniscule slice of pickle. The pickle slice was so small, I wondered why they even bothered with it. Prices for sandwiches were over $7. There is a nice list of salads and crepes on the menu, also expensive, but may be a better choice. There are assorted pastries if you want a sweet bite with your beverage. I noticed they have an afternoon tea menu as well, which seemed reasonable at $13. Keko cafe is a fine choice if you are in the Murray Hill neighborhood. Unless you go to Koreatown for a limited choice of teas, this is your best bet in the area.